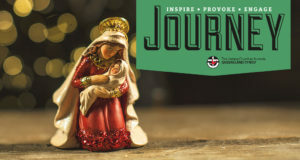 The April 2015 edition of Journey is now available to read and download. 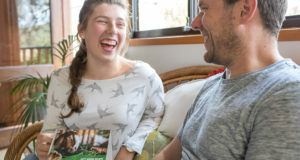 This month marks 100 years since the landing at Gallipoli; a critical moment in Australia and New Zealand’s history that is burned into the national psyche of both countries. Dawn services will take place around the world, paying tribute to the sacrifice made by those a century ago and all who have served and died since. The red poppy is a symbol of remembrance for those who have died in war and is used in wreaths laid at war memorials on Anzac Day and Remembrance Day. The Roll of Honour at the Australian War Memorial in Canberra, covered with red poppies, is a very special sight. 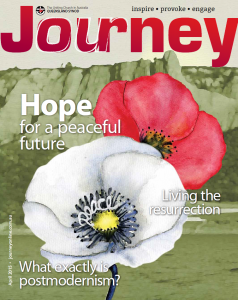 On the cover of Journey this month there is also a white poppy, a symbol for peace. Together they honour the sacrifices made in the past while hoping for a peaceful future. On page six there is a feature about conscientious objectors in the 100 years since Gallipoli. 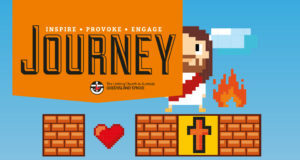 The Uniting Church ministers to the armed forces through military chaplains, and honour rolls are a common sight in our church halls, but it also has a history of conscientious objection and pacifist action. It’s a fine balance which the red and white poppies together capture beautifully. 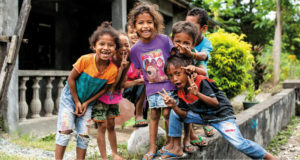 On another note, I would like to draw your attention to page 18, which has details of how to donate to the UnitingWorld appeal to support communities devastated by Tropical Cyclone Pam. 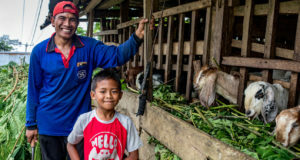 There is also a local appeal to support communities affected by cyclones Lam and Marcia in Australia, which we talk about on page five.